Often during a scene there is a need for a third character to jump into the action. While two players are performing a scene, a character may be mentioned and a third player off stage may be called upon to play that character to help further the scene along. As always, LISTEN!!! When on or off stage, every player should be focused on what is going on on-stage at all times. When players work together, amazing things happen. Improv looks just like scripted material. A great team looks like they rehearsed on a scene for weeks. Only, because of the spontaneity, it is far more interesting. Cameos occur when a character is introduced later in a scene. Players on stage might mention a 3rd character. A cameo could be used to strengthen the where. Cameos might help clarify the character’s history. A cameo might heighten the conflict. Perhaps a location is established. An off stage player can make a cameo to heighten that where. A couple is at the bank to get a mortgage. In comes the banker. Two kids playing at the beach. In comes the lifeguard. Two guys are barbecuing at the park. Smokey the Bear lectures them on fire safety. Perhaps things are coasting along and a cameo can spice things up. The third character adds conflict. The dynamic is changed. Having three warm bodies on stage visually makes the scene more interesting. At a recent college gig, Brian and Meg were doing a romantic scene. They were back at Brian’s apartment. I enter as Brian’s mom, unable to sleep in the other room. I could have easily enter as his wife, girlfriend, boyfriend, etc and would have altered the scene’s direction, now with heightened conflict. Below is one of my favorite EIGHT IS NEVER ENOUGH scenes ever caught on camera. We were in Weyauwega, Wisconsin at the Gerold Opera House. In a routine game of Columns (AKA Human Mad Libs), all five players got involved. Every one listened. Everyone contributed. And the result looks like a potential sit com pilot. A Canadian Cross is a brief cameo that adds something to the scene. On set for a TV show there are often extras. These extras add reality to the scene by showing other people living in the world. Also on that TV set are many players that have 1 line. They say their line and then are done, collecting royalties for years. In am Improv the Canadian Cross will add the same elements to our scenes. Two players are doing a scene. Other players make brief entrances and exits to add more levels to the scene. Just like cameos, we add elements of story, heighten locations, add some conflict, useful information etc. But with the Canadian Cross our character does not become part of the action. We do not interrupt the main flow of the scene. As new Improvisers and students, I challenge you to avoid cameos in favor of Canadian Crosses. By doing this you learn to add useful information to scenes. Add what is needed and get out. Too often players make a cameo and then proceed to hog the scene. This does little to enhance the game and better serves to alienate your scene partners. Directing yourself in a scene. In past posts, and in every class I teach, I talk about the Improv Player serving as writer, director and actor. With pantomime I suppose we are also set, props and costume designers too. As we start to do Cameos and Canadian Crosses this becomes all that much more important. 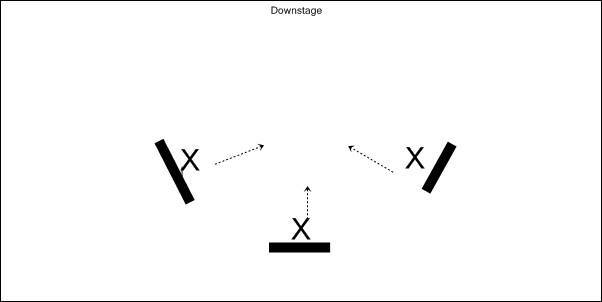 With only two actors on stage it is relatively easy to adhere to basic staging rules. Never stand right behind another player. In live shows always cheat to the audience. Stand at the 1/4 – feet at 45% angle -so that you can relate to both your scene partner and audience. As you move around stage avoid upstaging your self or your scene partner. A director has two functions. Navigate players to tell the story beyond the words. It is the second I discuss here. And in relation to cameos and Canadian Crosses, very important. While performing Improv, especially as new players, this is a lot to consider. But the difference between a dead scene of talking heads and genius might be a few simple staging choices. If you think of Improv as a series of choices, everything changes. From your first entrance to the closing line of a scene you are constantly making the choices an actor, writer and director make for every scripted show. The cool thing, audiences are very forgiving knowing your choices are spontaneous. There are things that work in Improv that would never work if the audience thought this was a planned event. To me that is very freeing. I am able to let go ego and insecurity and focus on creating. 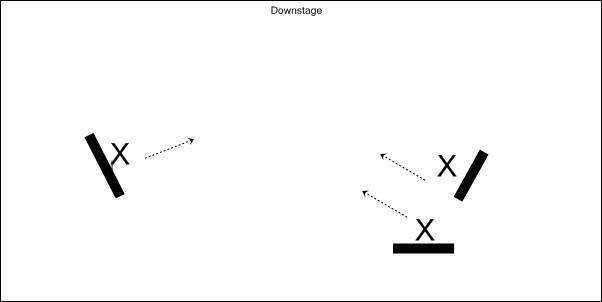 This diagram represents two players playing a scene. There are standing at an angle that allows them to face each other and the audience at the same time. When in doubt this is home position for a two player scene. However, if the scene remains here for too long the scene becomes talking heads – dull and boring. In music we often have a series of dissonance and resolution. In some modern dramatic pieces we never get that resolution. The audience is left unsatisfied – on purpose. On stage, we will have a series of movements and pictures that will visually strain the audience. – cause anxiety on purpose. This is a very big element of drama. And all great comedy is filled with drama. The staging suggested by the diagram above is a great place to start and finish and maybe pass through form time to time. This is the visual resolution the audience craves. The shared focus of two players has balance. When you stand downstage right facing away from the other players, the audience feels your distancing from the the other characters – whether you feel anger, sorrow, despair, jealousy… One of those players crosses to you. You feel their presence. Your characters anxiety heightens at that moment. As the other character places their hand on your shoulder, you either stand steadfast and ignore the gesture, melt and turn to the other character, or flee by counter crossing to down right. There is a lot of power in extreme angles. However, if you stand in that extreme angle for to long it becomes stagnant. If you stand upstage of your partner for too long it just looks like you don’t know what you are doing. The audience subconsciously expect resolution. When in doubt a three person scene, visually becomes a series of triangles. This way the players are never in a straight line. If you were to observe groups of three friends in the world, you would see the same. Either someone is walking in front with the other two following behind. Or there are two up front with a third just behind. Sitting at a table they would rarely sit all together in a line on the same side. In the diagram above we see three players in a balanced symmetrical triangle. In this form, the person at the top of the triangle is most likely the primary focus, but that can change. 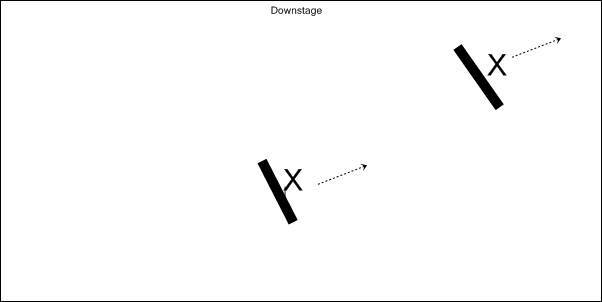 As that person crosses to either player down right or left they change the balance of the scene. Like the diagram from above of Shared Focus, this formation serves a resting place for a three person scene. But talking heads here is just as boring. Move around and experiment how various triangles support emotional response from other players and the audience. Now perhaps the players stage right are plotting against or judging the other character. There is a clear bonding of these two players and alienation of the other. For those that are not studio or college trained actors first, you may want to review some of these basics. If you are trained, review and remember how important to include these basic acting movements into your improv. I always say great theater trumps bad comedy any day. Focus more on movement and more typical acting issues and less on being clever with your words. Movement inspires language. Keep scenes interesting with movement and words will come to you naturally. Body and head are facing audience. Anything important deliver straight to the audience. Stay here to long you lack connection to other players on stage. When in doubt this is the best place to be as you relate to audience and other players. Standing on the angle between full front and profile (full to off stage or other player). Your feet, shoulders and head all are on similar angle. Watch out the bad habit many young performers have. Their feet face one way while they turn head to face another. We naturally do this from time to time but only young/new actors do this for extended periods of time. Two actors are facing each other 100%. Usually for intense scene between two characters. Stay here too long you lose your audience. Actor Angles away from the audience. This position is bad while speaking in most cases, but powerfully gives focus to your scene partner. Almost never used, this is usually a statement of total rejection. Or perhaps a military or dance movement. Use on purpose to create awkward distancing from audience. Stay there to long we just think you don’t care about us watching. 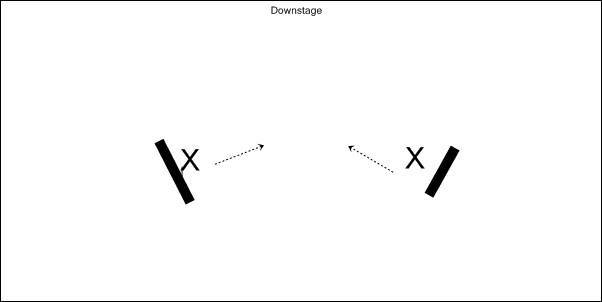 Movement on stage becomes a series of crosses and counter crosses into new positions. Your character has purpose and takes the most direct line of attack. Your character chooses a less direct approach. Walking in a C or S pattern, you are manipulating the scene. Maybe you are flirting. Perhaps you are trying to annoy. Maybe you are bragging. A curved cross could also show indecision or casual state. An S-CURVE for some characters makes us think of a snake. In others a flaky quality. C-Curves can serve as a less intense straight cross. You want to get there in a way the keeps yourself open to the audience. Take one step upstage then head down to your destination. Your cross opens your body to the audience. You reveal yourself. Take stage and focus. You have something to say. You want to be seen. You turn away from the audience. You hide yourself. You give focus away. As one actor crosses stage, we counter cross to maintain a visual balance. Our characters may be crossing just top escape the approaching character. You cover another actor when you directly block the audiences view of that actor. Most of the time this is a no no. However for special effects, fight scenes and more, we often cover on purpose to hide the stage magic. Most of the time, young actors cover other actors out of ignorance. If another actor covers you simply counter cross to fix. I often say, when in doubt, never stand in a line or directly behind another actor. If you remember nothing else, keep this simple rule in mind and your will survive. This entry was posted in Learn to Improvise and tagged anti-bully, artists, better, broadway, building, bully, cameo, camp, canadian, character building, class, classes, club, comedy, cross, enter, games, how to, improv, interactive, interesting, learn, new york, scene, scenework, sessions, workshop. Bookmark the permalink.